Quit boiling or microwaving green beans. This quick skillet method is my new standard go-to. 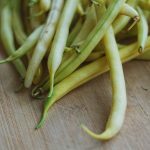 The beans are perfectly crisp-tender, and retain their vibrant color and taste. Place 12 oz fresh green beans into a large skillet. Cover & boil for 3 minutes. Uncover & add 1-2 Tablespoons butter or olive oil. Cook until water boils dry stirring frequently. Vegetarians: Add additional seasoning by tossing the beans with a drizzle of honey and dashes of low sodium soy sauce before serving, if desired.